The Big Idea is a Sydney Research event focusing on developing research innovation and commercialisation. The event forms part of the 2019 Sydney Innovation and Research Symposium, and will be held on Thursday 27 June 2019. 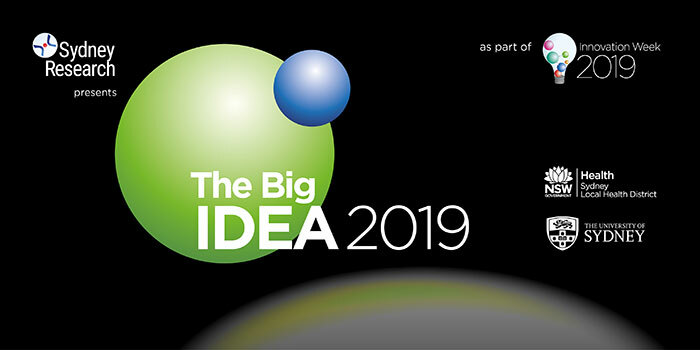 The Big Idea is an innovation challenge providing pre-seed funding to recognise and progress very early stage ideas with commercial potential and to improve the commercial opportunities available within the Sydney Research precinct. The goal of The Big Idea is to support researchers in launching or progressing ideas that have commercial value in healthcare. The Big Idea also provides the opportunity for researchers to gain exposure, support and mentoring through sponsors, industry and participating venture capitalists and investors. Ideas must have a demonstrated potential for delivering value in healthcare. This includes the development of theories, methods, treatments, devices, technology and systems to optimise the design, conduct and outcomes of healthcare and health and medical research. Sydney Research has designed its STRIVE Research Impact and Commercialisation Series to support The Big Idea in 2019, with a series of workshops designed to help understand what it takes to make your idea successful for research commercialisation and learn how to pitch your idea to gain financial support from a range of funding sources. For more information, please contact SLHD-SydneyResearch@health.nsw.gov.au or call Phoebe Ng, Program Manager Sydney Research on 9515 9642.